Steam’s finances are a subject that has traditionally been kept under wraps, which makes the number and concentration of details that have been slipping out lately all the more surprising. The recent billing ‘problems’ and Steam’s appearance at Asian Game Developers Summit 2005 (which was held earlier this month in Kuala Lumpur) have both led to a stream of details that reveal at last the true extent of Steam’s financial successes, failings and limitations. If you thought Steam needing an exact match for billing details was overcautious, that figure should convince you otherwise. It’s just one example of how much Steam suffers for selling entirely ephemeral products in a world where proof of purchase laws are based around physical ones. The burden of this proof (and thus potential for fraud) is far higher when it relies on information about the card and card owner that may or may not be up to date or entered correctly, as opposed to someone holding the item in their hands or at the very least signing for it on delivery. There’s not a lot anyone can do about this in the short term: any solutions will come only after the growth of digital distribution to a size where it can demand them. Similar problems plague any attempts to transfer a product’s ownership from one account to another: proof of purchase is the credit card, the credit card is non-transferable, and thus as far as the law is concerned the original purchaser still owns the product. They have the legal right to take it away from the buyer and potentially sue Valve for allowing the transaction in the first place! Valve claim that returns account for about 1% of transactions, but it’s likely that the number of transactions that don’t happen in the first place is far higher. 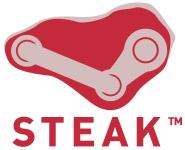 On a lighter note, the sales figures for Steam were indirectly revealed at AGDS when Valve’s speaker there, Mike Dunkle, said that ‘75% of their business’ came through retail channels. This could be taken two ways, customers or profits, but the gap between Steam and retail profit margins together with Doug Lombardi’s statement that Steam had been ‘wildly more profitable’ for Valve confirms it is the former. The latest official sales estimates are 3 million, and therefore Steam sales number either 750 000 if the 3 million includes them, or 937 500 if it does not. 2011 update: developers now receive 70%. Profit margins for developers are a major selling point for digital distribution, and Steam does not let the side down. I’m pleased to say that there are now figures as accurate as possible for each margin: 10%-20% for traditional retail/publisher deals; roughly 60% for Steam developers; and an incredible 86% for Valve themselves. Add to that the fact that Valve doesn’t take the developer’s IP and the effective margin becomes wider still. These sorts of numbers aren’t easy to come by for distribution services, but it isn’t unreasonable to say that the 26% net margin difference between Valve and their Steam licensees is quite wide. Perhaps when xStream ramps up we’ll see some healthy competition. Payment methods have been an irritation to the portion of Steam user base lacking a mainstream credit card for some time now. PayPal has been one of the more popular suggestions for an alternate service, but as we can see here it simply isn’t an option. It’s the same problem as the AVS checks and transfers mentioned above: fraud protection for a digital merchant. Of course Valve want you to be able to get their games, but they don’t want to have hundreds of other copies stolen at the same time. Returns are a different matter however, and their absence is for more practical reasons. Not issuing refunds for used goods is a worldwide practice, especially in the software industry where duplication is so easy, and while Steam has the advantage of the shrinkwrap EULA paradox not applying it retains the problem of safely offering refunds. Newly purchased licenses are downloaded immediately and can be copied around as soon as they arrive; there is no ‘grace period’ between purchase and installation here. Or rather, there isn’t yet. A remarkably simple solution would be to offer an optional refund period of a few days (or earlier if the user stops it) where new licenses are not stored on clients, disabling offline mode and preventing casual duplication. The result: no security concerns past those who ‘wouldn’t buy it anyway’ and more reassurance for prospective customers. The last remaining area of interest is Steam defining all purchases as subscriptions. When Steam was still relatively new there was much concern over the reasoning behind this – surely it could only be because Valve wanted to charge a subscription for their currently single-charge games, in a ‘pay-to-play’ model? Those fears may have since proven to be unfounded and suspicion may have died down, though if you rattled the right cages it would probably reappear, but the question remains. If the end-user games on Steam today need only one payment, and if Valve are unlikely to be able to change that, why does it still treat them all as subscriptions? The answer may well be a legal one, as, while subscriptions can be terminated at will, disabling an account with permanent purchases is towards the black end of its grey area. Should that be true Steam’s subscription model can be seen as more of a disclaimer than agreement, but the truth of the matter is that we don’t know. I don’t think anyone reading this could say that Steam hasn’t done very well on almost all financial fronts. A change in financial law to better support digital distribution would remove the biggest barrier that Valve (and digital distribution services in general) still face, with the other issues simple enough to resolve. Even without those improvements, it is remarkable how well Steam performs with such stringent restrictions from banks and such a thin layer of protection from fraudsters: it will be interesting to see how much better things get if and when those limitations are lifted. Nice work. I heard, second hand, from a dev with a Steam publishing deal, that the split is 50/50. He also quoted some Steam sales figures that were pretty phenomenal. can you reveal the numbers, Tom? I wonder if the EULA changes and you reject it, does that mean you can return the software?? Besides, Valve can disable your account without notice. One problem with online purchases, what about the people who decide to get rid of the internet? Or no internet at all? Online activation is a great idea, but not everyone in the world has the internet. I could go on with the flaws of Valves EULA, but I will leave it up to the reader.